For more than forty seasons, Jim Boeheim has been one of college basketball’s most successful and compelling figures with the second-most victories of all time behind only Mike Krzyzewski. The Hall of Fame coach has led the Syracuse Orange to five Final Fours, including a memorable national championship in 2003. 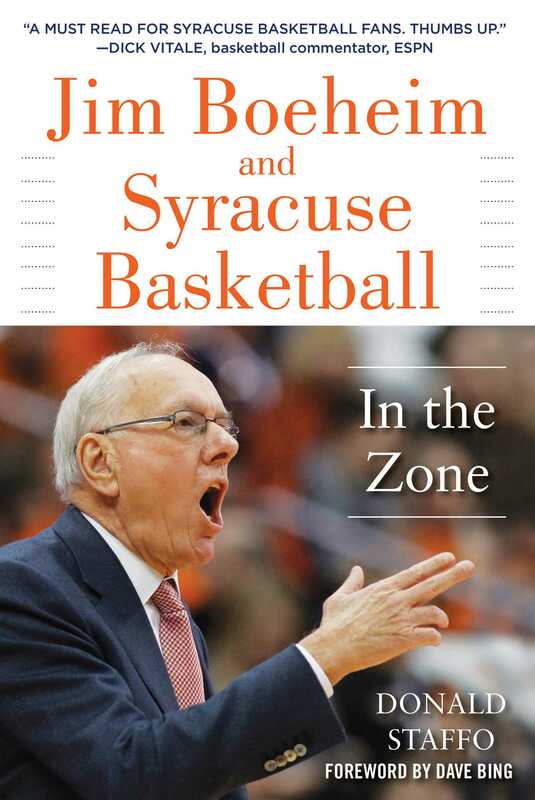 In Jim Boeheim and Syracuse Basketball: In the Zone, Donald Staffo examines the career of the storied SU basketball coach and the elite program that he built. Boeheim’s accomplishments as well as his considerable charitable work cannot be denied, nor can the sanctions that occurred under his watch. Both sides are covered in depth—the highs and lows that have made Boeheim a legend and Syracuse a basketball power. After taking over the program in 1977, a decade after his own playing career at the school, Boeheim transformed it into a national power behind such stars as Roosevelt Bouie, Pearl Washington, Sherman Douglas, Rony Seikaly, Derrick Coleman, Carmelo Anthony, and C. J. Fair. Staffo brings to life the wild environment in the old Manley Field House and a packed Carrier Dome. All the unforgettable moments are highlighted, including the 2003 championship win over Kansas, the epic six-overtime classic over UConn in the 2009 Big East Tournament, and the surprising run to the 2016 Final Four. It also analyzes Boeheim from a point-counterpoint standpoint as well as the image of the Syracuse basketball program compared to other hoop powers. Jim Boeheim and Syracuse Basketball is a revealing look at a basketball legend. Donald Staffo is the author of ten books and more than 2,100 articles published in a wide variety of national and regional magazines and newspapers. He covered Alabama football and basketball for thirty years for the Associated Press and other publications and lives in Tuscaloosa.